This award winning boot provides unbeatable protection against the cold. The Vierzonord Extreme is lined throughout with 5mm of premium quality neoprene (compared to 2mm in the standard Vierzonord). Specifically for this boot, Le Chameau have developed a removable aluminised insole which reflects body heat back into the boot further maintaining a comfortable temperature. 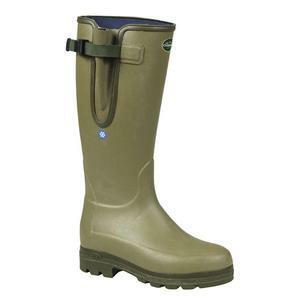 This double protection makes it very difficult for cold to penetrate the boots from the ground. These practical features and use of technical materials make the Vierzonord Extreme ideal for the coldest of winter days or for those who really feel the cold. Does what they are supposed to first pair lasted 5 plus years worn nearly every day warm and toasty in the winter too. Excellent value boots that last years! These boots are a different class!!! Rubber is so soft and supple everything about them screams quality. Extremely well made and very warm. I always like to wear with a thick pair of woolly sock. After a 5 mile walk and having them on for over 4 hours no rubbing and very little sweating. Always had Hunters in the past which were good but fancied a change as friends have had issues with new boots splitting. My 3rd pair. Says it all.